Last month, we decided to have a family moon to celebrated our late holidays. 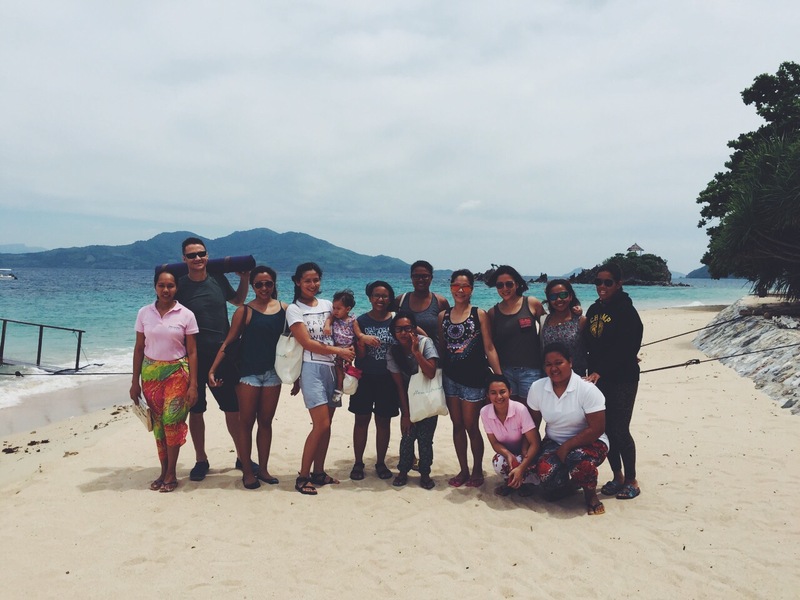 We flew in after the New Year and my son ended up missing a few days of school but it doesnt matter because we really wanted to bond as a family before my husband left for work in the islands back home. Malaysia was a new destination for the whole family, a country we haven’t ticked off our bucket-list together as a unit. So, we booked our tickets in advance with our favorite low cost airline, Air Asia. 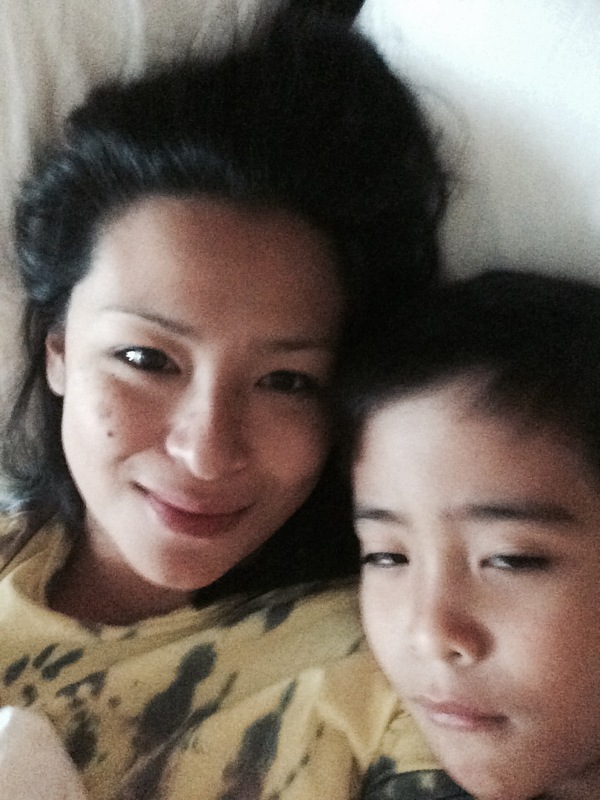 The plan was to stay a few days in Kuala Lumpur before traveling to Penang where my husband and my kids have not been. I previously researched on where we could possibly do some R & R and found out about Hard Rock Hotel in Batu Ferringhi, Penang. This place had some very high reviews online so we had to experience it for ourselves and it did not disappoint at all! Oh, we were so envious of the people who has direct swimming pool access from their rooms although realistically, this may not be the safest choice for families with very young children. The winning factor for Hard Rock Hotel is their water park themed pool which was superb for the kids! My children literally stayed, swam and played here all day because they were having such a blast! They even have cool activities such as this pillow fight on a balance beam in the pool! And because the kids expelled so much energy at the pool, they become very, very hungry. Good thing there are good pool-side grub for eats! And so we ordered the best thing on the menu! For people who want to protect their skin from the harsh sun, Hard Rock Hotel has canopies all over the pools where you can sunbathe without over exposing yourself. This is where we chose to watch over our kids and eat our snacks as well! We were so amazed by the birds just flocking over to us. Unlike the Maya birds we are accustomed to back home in the Philippines, the birds hanging out with us were more of a rare species it seems. I was able to catch a snapshot of one and am totally amused that we can go bird watching just by the pool of Hard Rock Hotel in Penang, Malaysia without any binoculars. What a treat! And to those beach lovers like us, we couldn’t resist the call of the ocean so one morning we took a stroll by the sea to check out the scene. I can imagine it would be so nice to exercise here as there aren’t that much people in sight. It was a trip to see a horse on the beach. For couples with older kids wanting time of their own, they can choose to “deposit” their children 3 years – 12 years old at the Hard Rock Roxity Kids Club for age appropriate activities for the young ones. Since my darling daughter didn’t meet the age minimum of 3 years old, we weren’t able to try it out. Oh, but she wanted to go inside! Better luck next time, I guess! 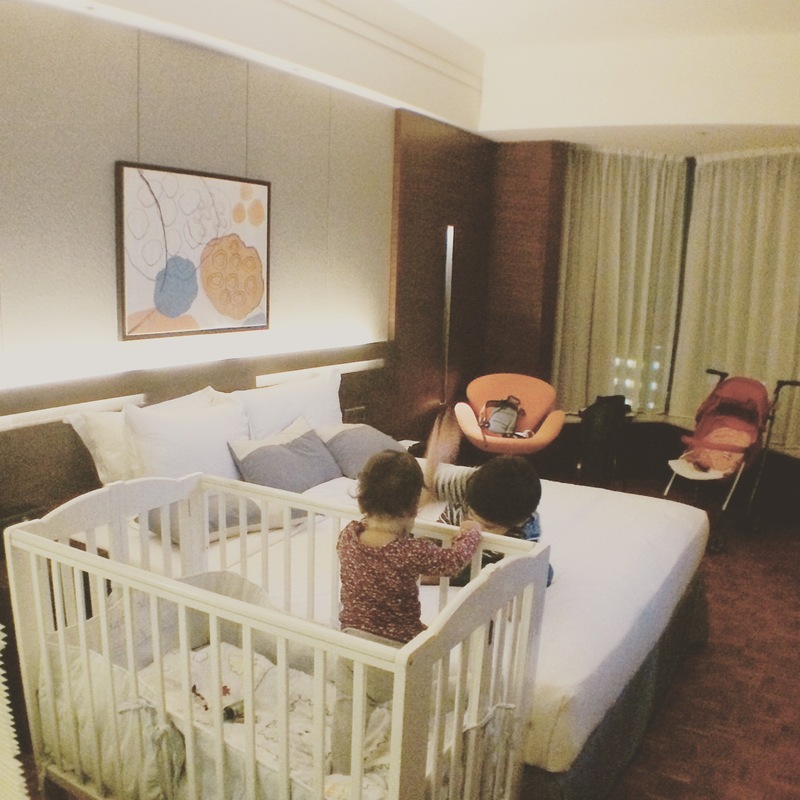 Another highlight was the Roxity Kid’s Suite because they have a whole different section only for your children in the room. A pull out double bed which is super comfortable for 2 children. I could even fit next to my child because at night I would put my younger one to sleep before transferring to the main king sized bed next to my husband. These sweet details for the kids make our hearts sing with delight! This room situation is totally ideal for couples wanting some space and alone time at night! Yes, the kid’s section has a sliding door so you can actually close off your own much needed space! Feeling inspired by Elvis Presley or John Lennon? You can listen to your rock idols in the room with their endless music selection of music legends. You’ll see tons of memorabilia from famous rockstars displayed all over the hotel. 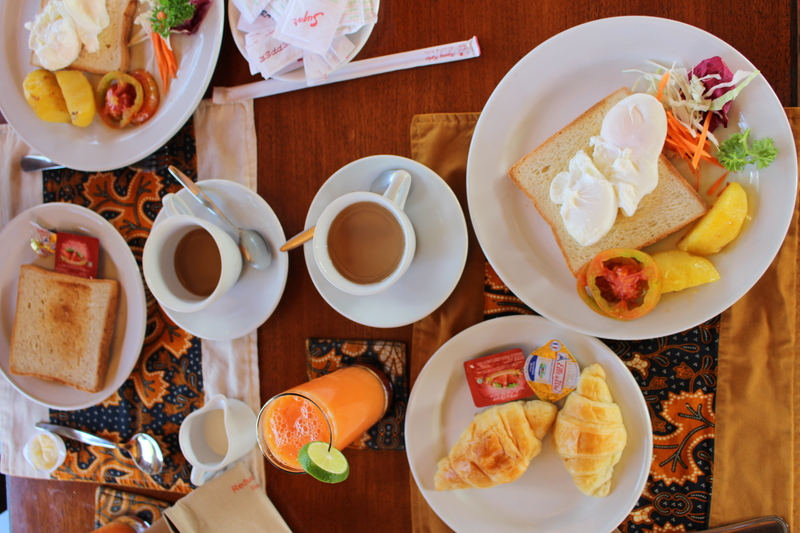 We genuinely enjoyed the breakfast buffet which had a nice selection of cuisine. Of course I chose mostly the local Malaysian eats because I know I wouldn’t have access to these dishes back home. I absolutely love anything “Nasi” and honestly, craving for it at this moment as I type. 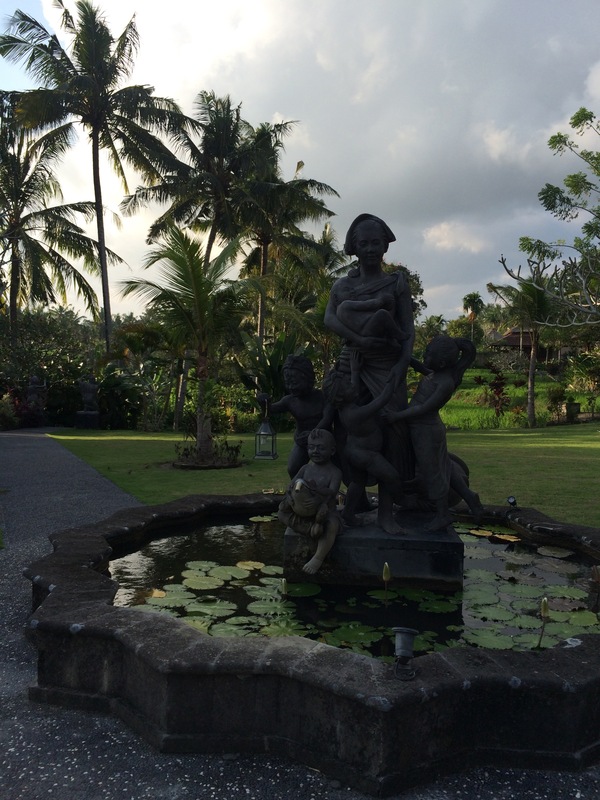 Our final night in Bali after closing the #FlowBali (check out photos from Instagram!) 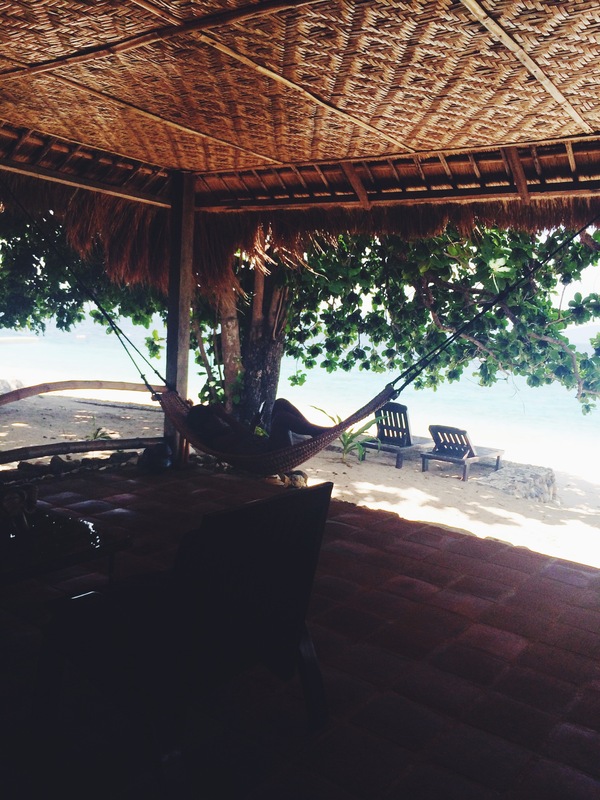 Yoga Retreat was a real treat given it was spent at the luxurious Sapu Lidi Resort and Spa. Sadly, we arrived after our Big Tree Farm Chocolate Factory tour in the late afternoon so I only had a few hours to take it all in amidst the sunlight before it got too dark for photos. 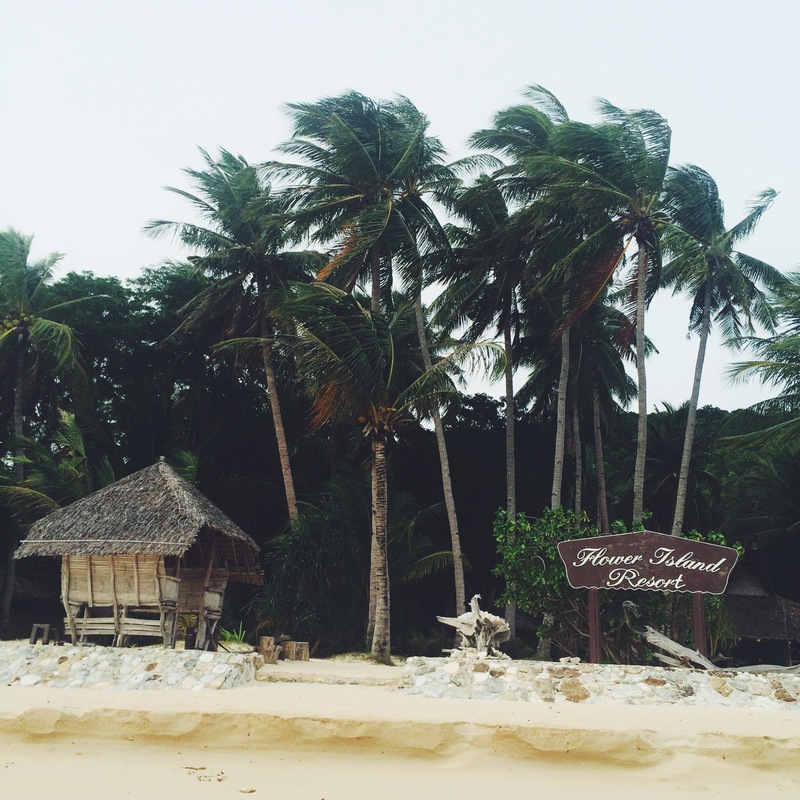 Please share my delight in these snippets of the resort surroundings! 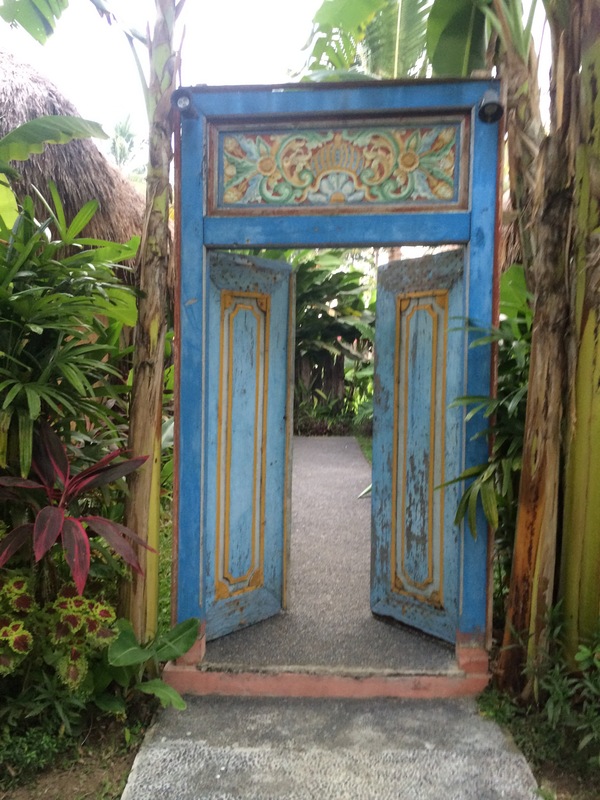 Doors and pathways always lead to a destination worth taking! My kids like big beds. They roll around and sleep in funny positions. This passed Maya’s standards alright! Look at this lake view room! I really wish I had stayed longer! My husband would’ve loved to stare out from here. I’m hoping to be back (crossing fingers and toes!) so that he can experience this room for himself, too! 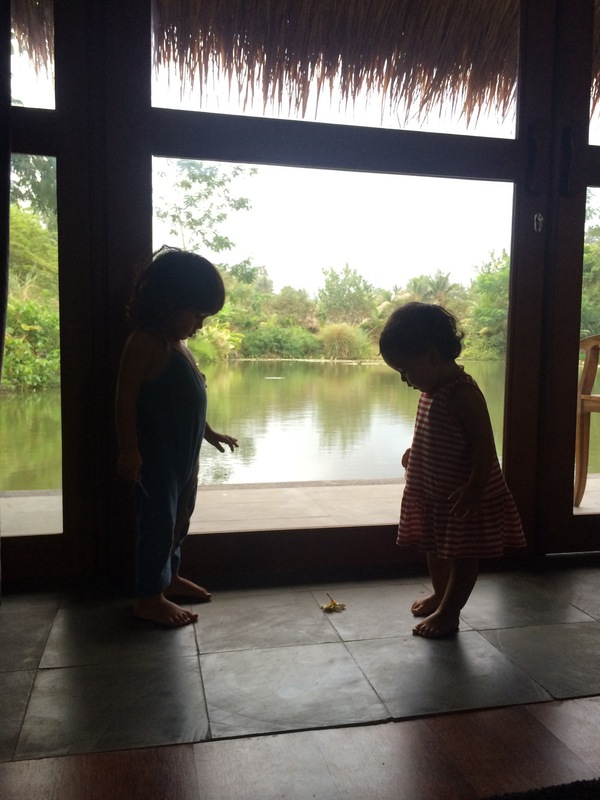 Maya had a visitor, a local friend named Tala. These little globetrotters had a flower staredown. Too cute for words! I was glad to catch one of the local staff with her offerings for the day. 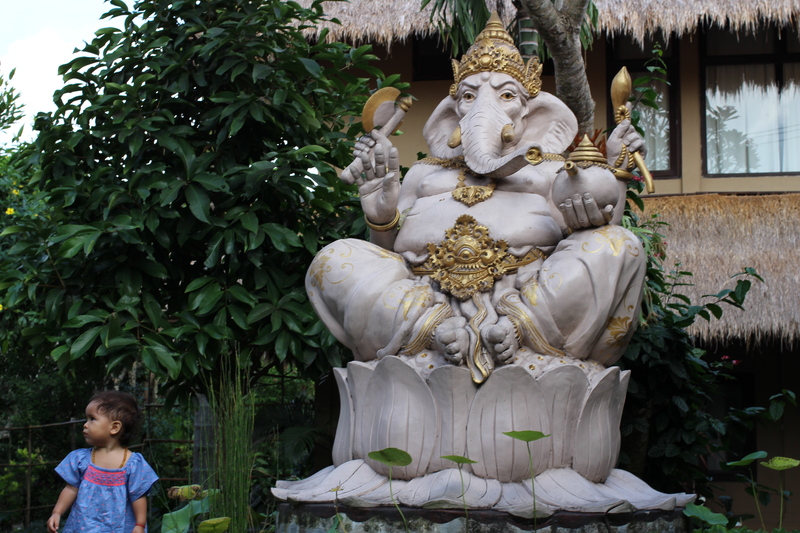 It is one of the characteristics I love about the Balinese people, their sense of spirituality is embedded in their daily rituals. So very beautiful! If we didn’t stop them, these kids would’ve jumped into the pool! This organic bridge leaves no trace when it dilapidates. I’m digging the green architectural design! Bravo, Sapu Lidi! 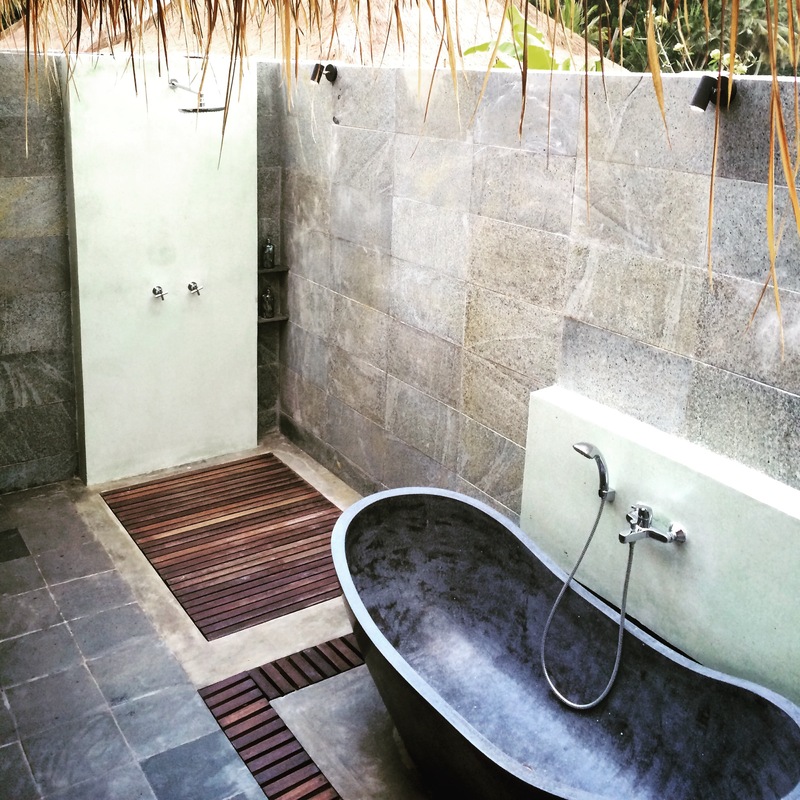 And their bathroom is totally my kind of style. 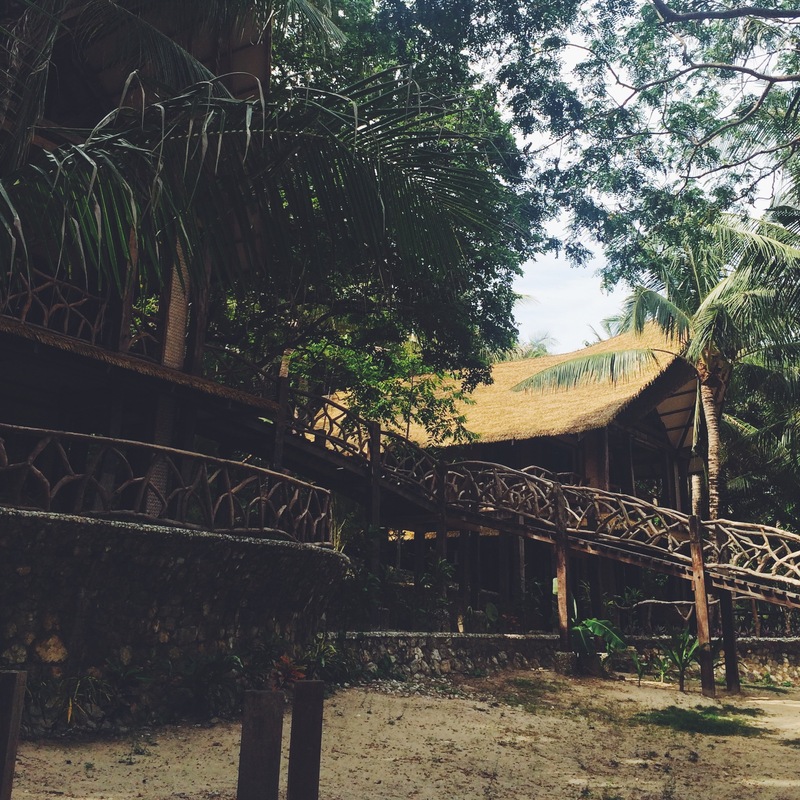 If you love bathing in the outdoors, underneath all the stars and the moon, then book this resort for your next Bali stay! I reckon you can teach your kids all about the constellations on a clear night from there. 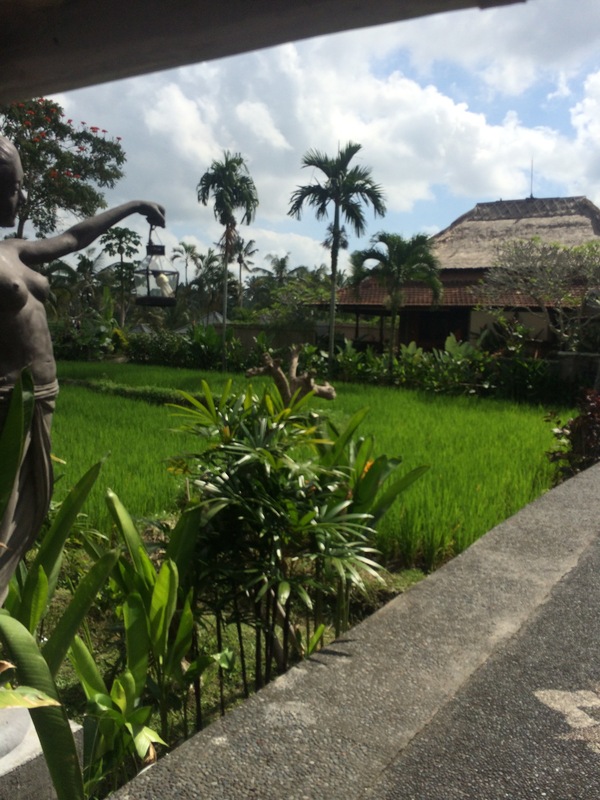 Ended on a Bali high with a much needed traditional massage with one of their local therapist. I promise you her hands were magic! 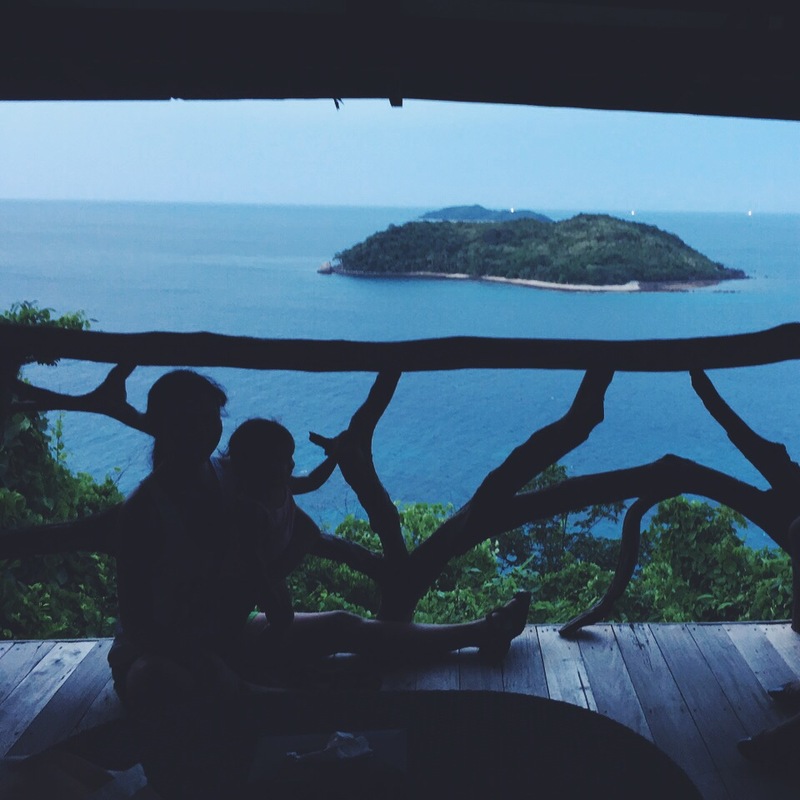 You may book through Agoda for real good deals here. Enjoy your stay! The first thoughts that came through my head as I approached the island resort, “Wow all of the photos I’ve seen don’t do this place any justice!” You cannot capture the essence of Flower Island by mere pictures alone. 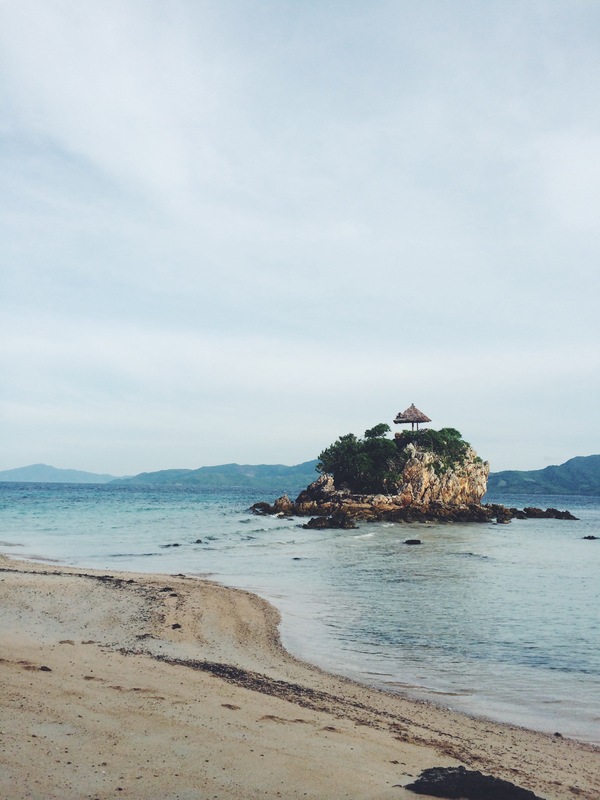 Powder fine light brown sand, all hues of blue on the clear skies and in the clean ocean, and an island sanctuary all to your group… the experience is so dreamy it is almost ethereal. 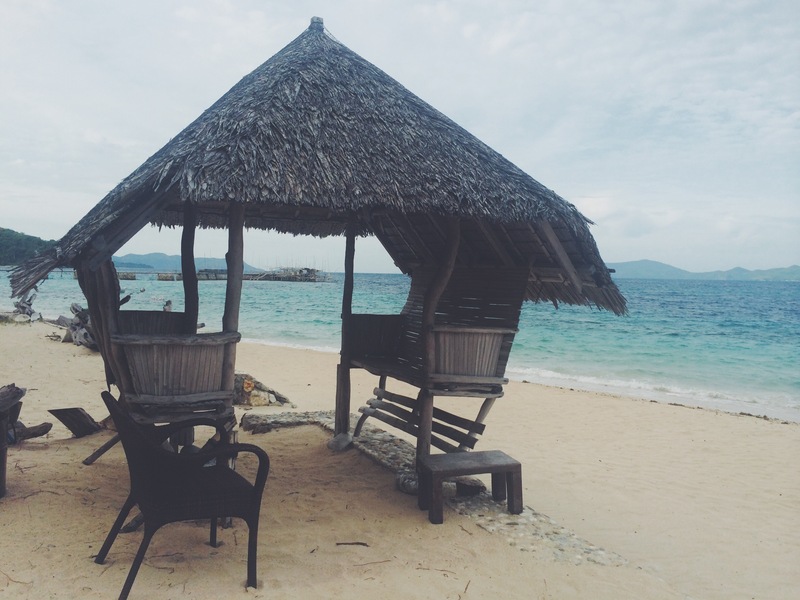 Flower Island Resort proves to be a very special and secluded place that’s real hard to get but worth the almost 7-hour travel time. 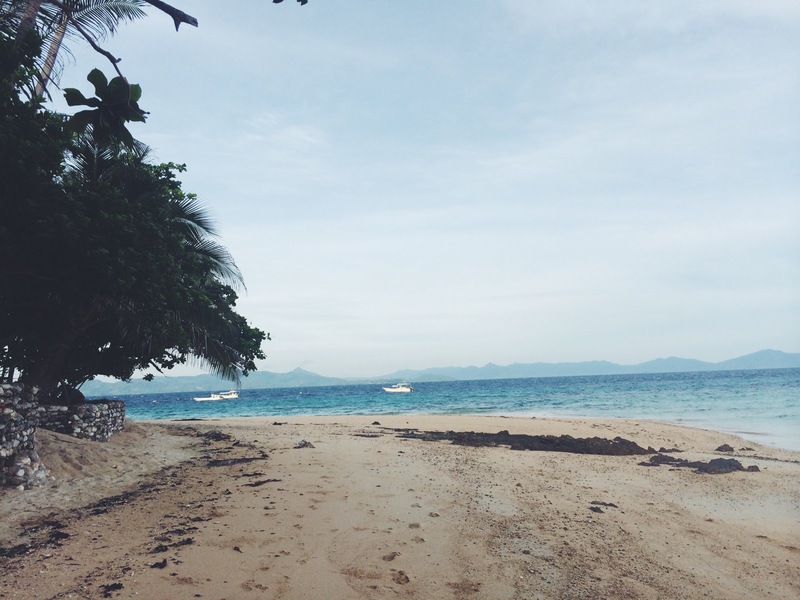 (Plane from Manila to Puerto Princesa-1hour, Van from Puerto Princesa to Taytay-4 hours and speedboat from Taytay to Flower Island- 1.5hours) The long travel is definitely not for the faint-hearted. 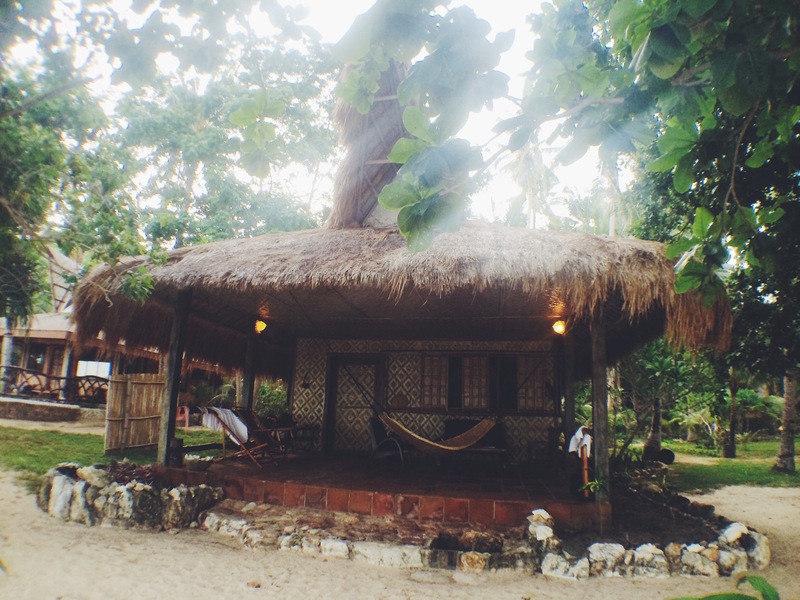 But we’re willing adventurers so we are rewarded with this piece of paradise for 3 whole days! 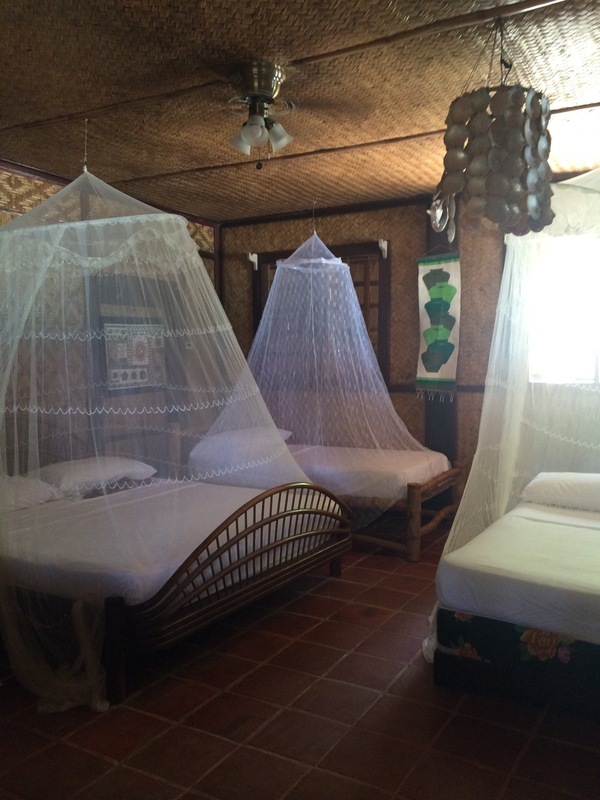 We stayed in room 9 which is the second closest fan hut to the reception and dining area. 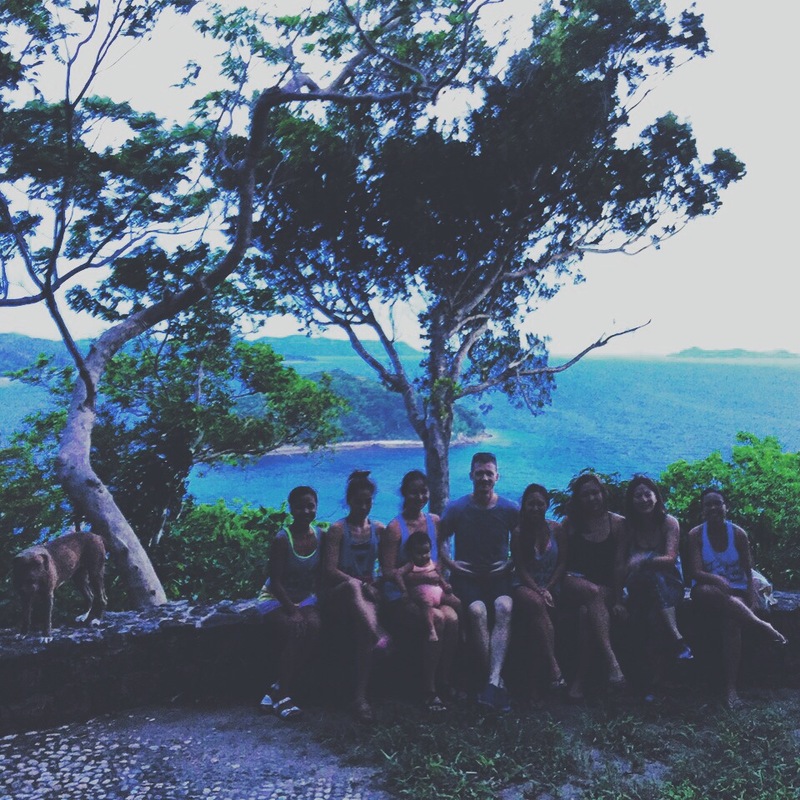 This trip was actually work for me, A Yin & Yang Yoga retreat by FLOW. 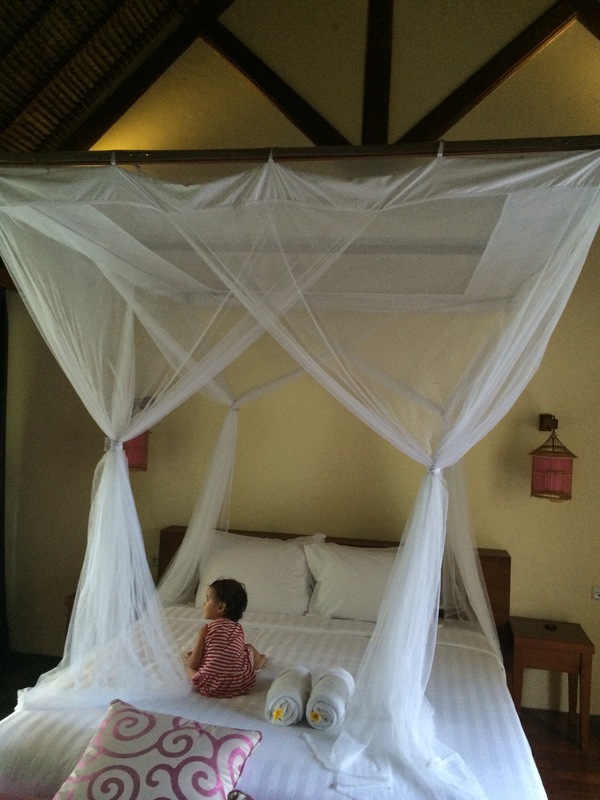 I roomed with another yoga teacher, a photographer and of course my little one who goes wherever I go! I was glad to see the spacious hut good enough for a family of 5! 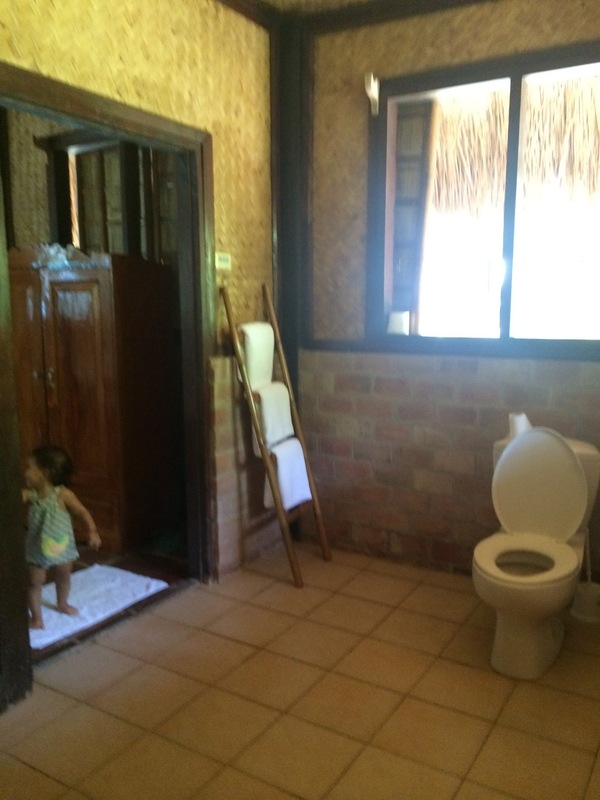 I didn’t take a very good photo of our bathroom. It was very dark so I chose to open all windows to bring the light in. My roomie taking a nap with that view. The breeze lulls you to sleep, really! This is us in the beginner friendly hike trail around the island which took 45-minutes. And this is the prize for hiking to The Peak, a 360 view from the top of the island. 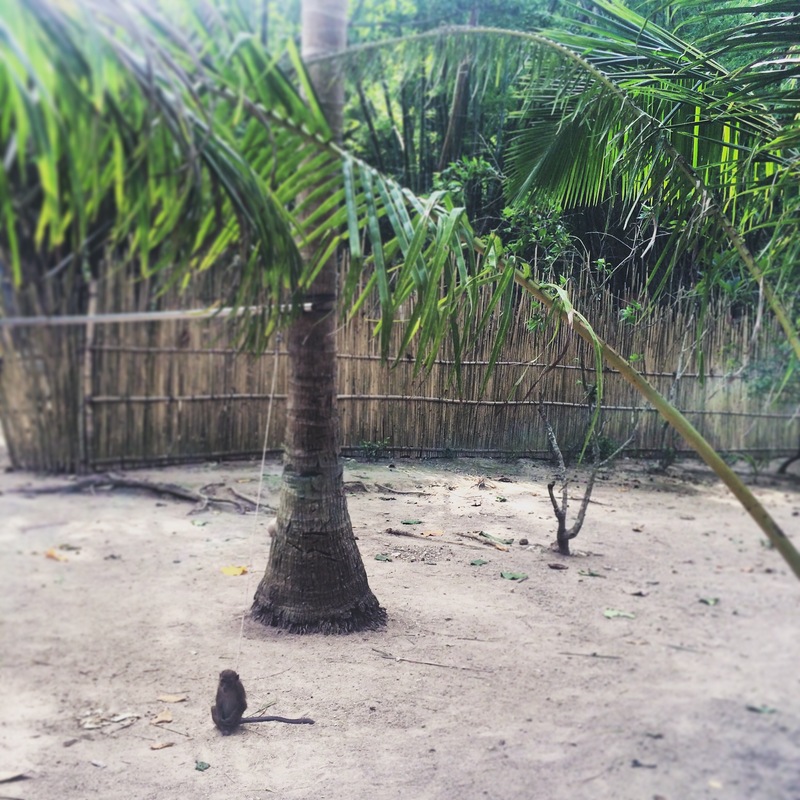 They also have an island monkey to Maya’s delight! The resort staff were very friendly, maybe it’s because we were the only guests there! Nevertheless, we enjoyed their service. And I applaud their chef’s baking skills. 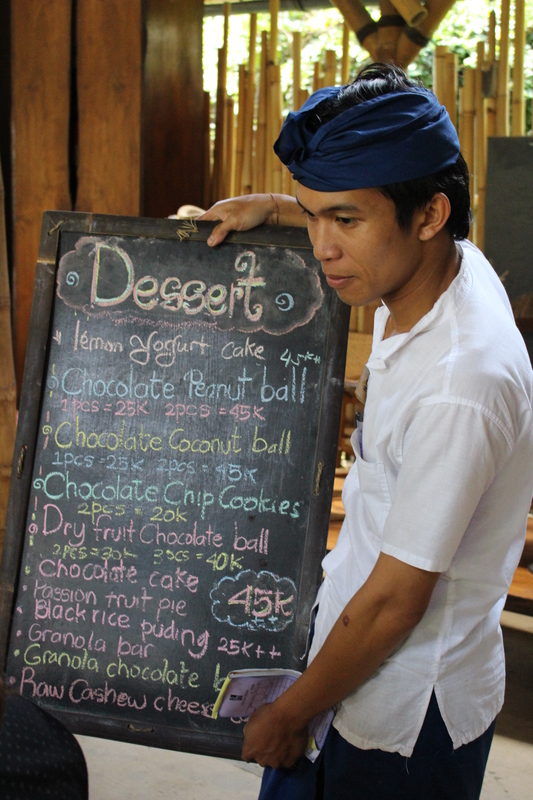 All of our desserts were made from scratch in the kitchen. 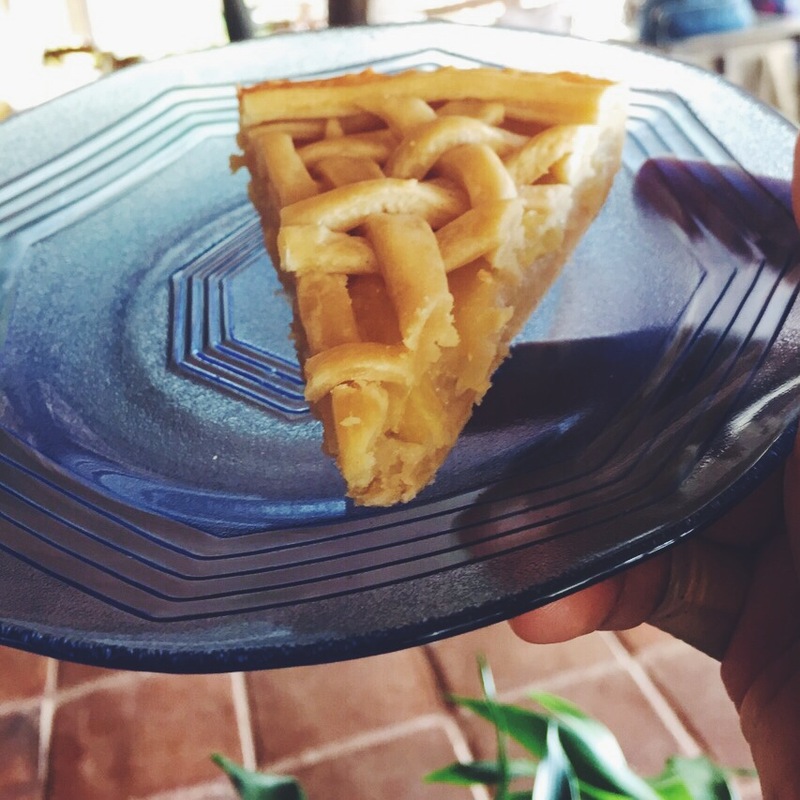 We had really good chocolate cake, pineapple pie, macaroons and the best sesame cookies I’ve had in my entire life. I’ll be craving for them I know it! I hear that soon they will have the option for sea planes to cut the travel time short. Hmm..so very tempting! 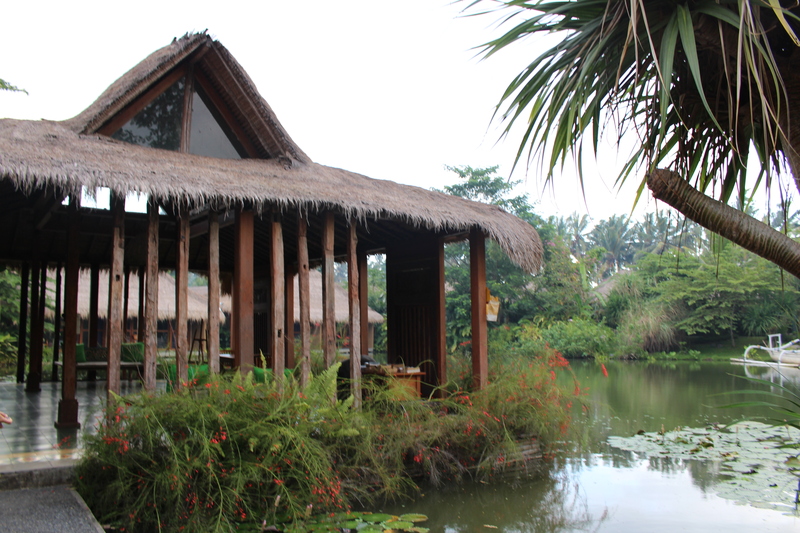 One of the reasons why I fell in love with Bali many years ago is because of green architecture. 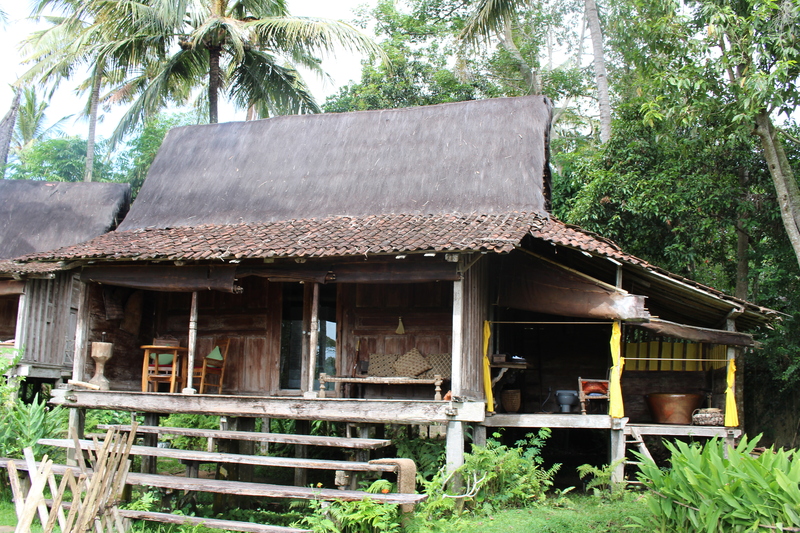 Most properties in Ubud like Bambu Indah use local indigenous materials to build. 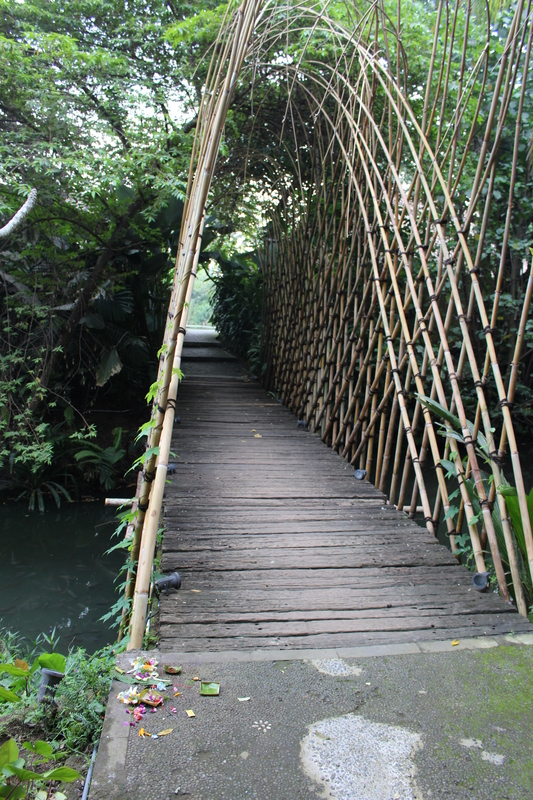 Bamboo structures are very famous over there and I wish that we could follow suit in the Philippines because we do have an abundance of it, too! The entrance itself is a sight to behold. John Hardy and his family, the creators of this gypsetter’s mecca have executed their vision impeccably. 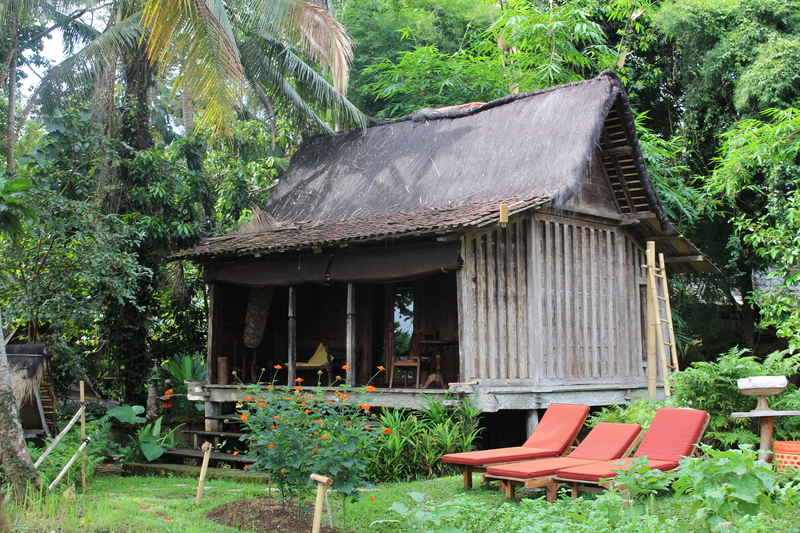 First at Green School, and then with this beautiful tropical piece of paradise you may call home for a few days, if you book here for the duration of your vacation. 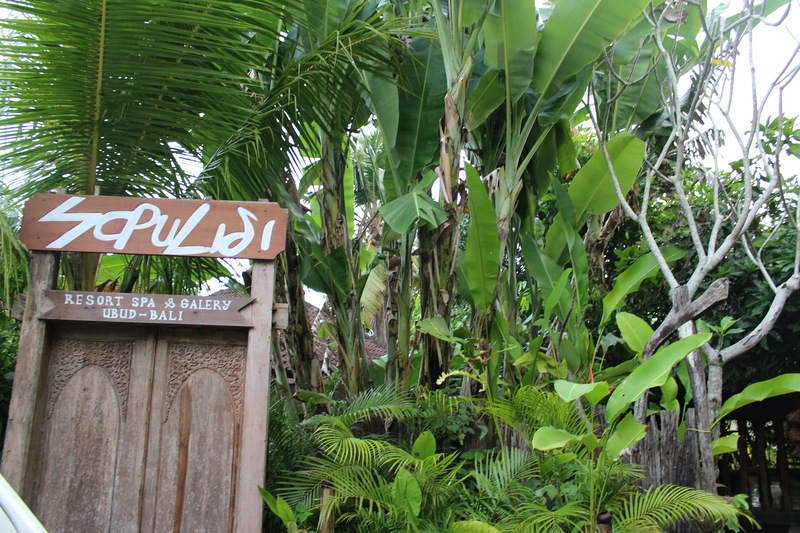 Our first meal in Ubud was in their restaurant called Dapoer which promotes slow food. Most of their ingredients are sourced organically, locally and fresh, if not, from their very own gardens. 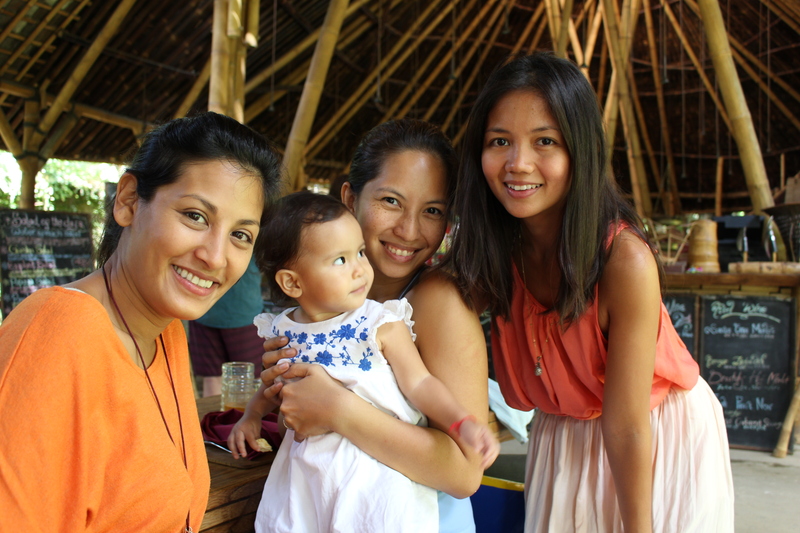 On this trip, my little globetrotter Maya got to spend precious moments with 3 of her fairy godmothers! How cool is that? As expected, the food was delicious! 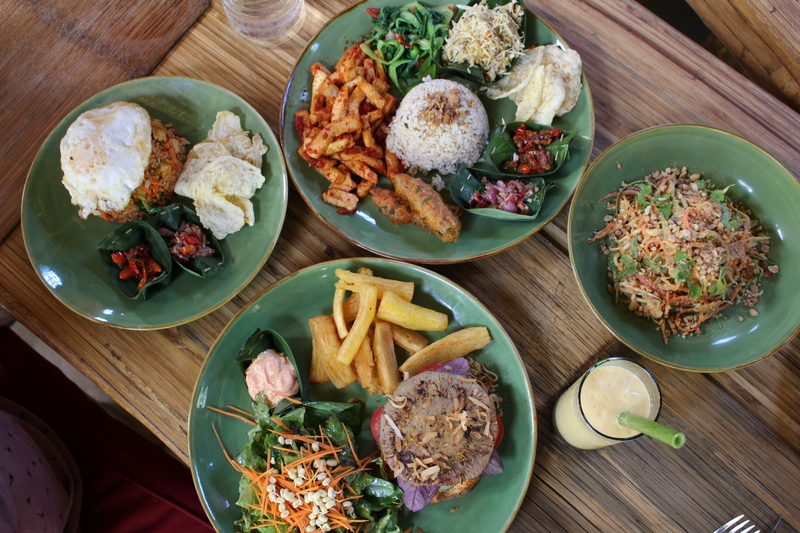 Although if you’re dining with kids, be vigilant about spice levels in local Indonesian dishes. My order was too spicy for my daughter! 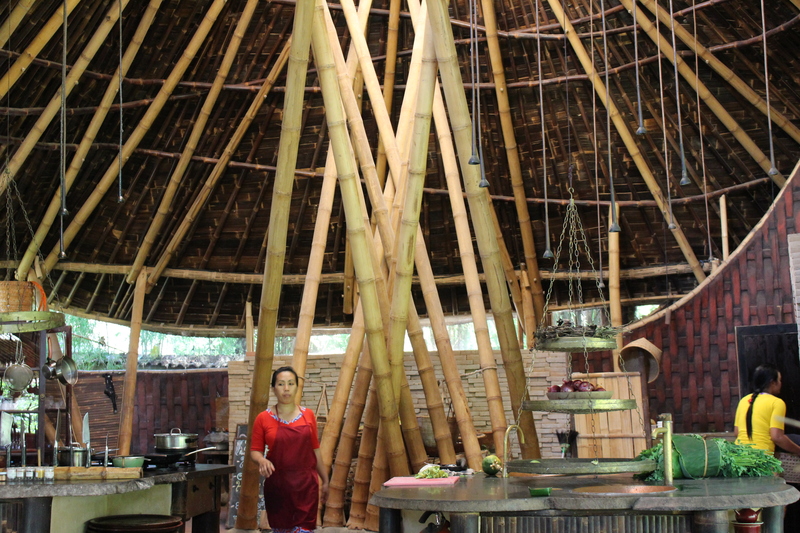 After eating, we asked for a tour of their eco-luxury resort. 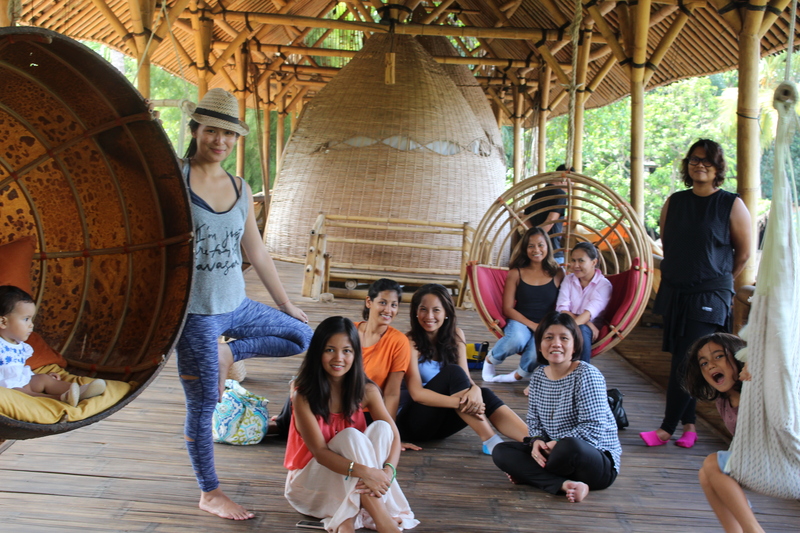 This is our almost-complete shot of the #FlowBali crew. Missing Woochae from Seoul here! 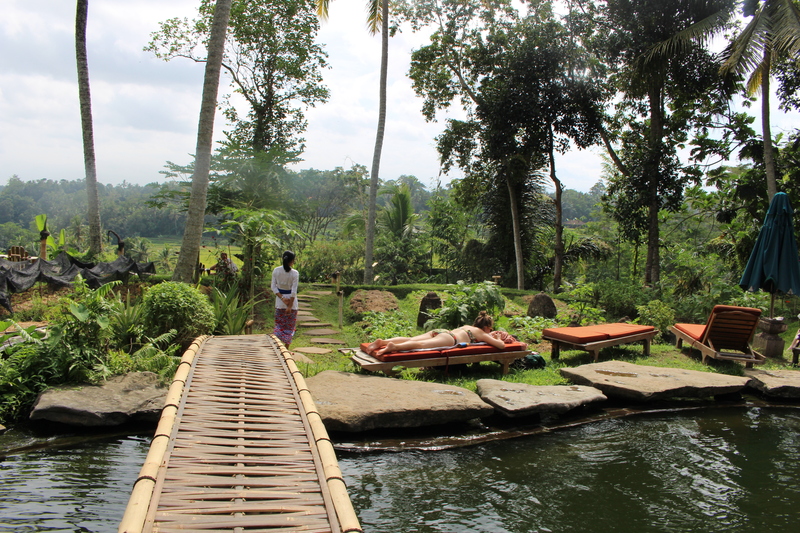 It was a hot hot day so I wished I could’ve swam in their natural spring water pool. Maybe next time we book a room here! 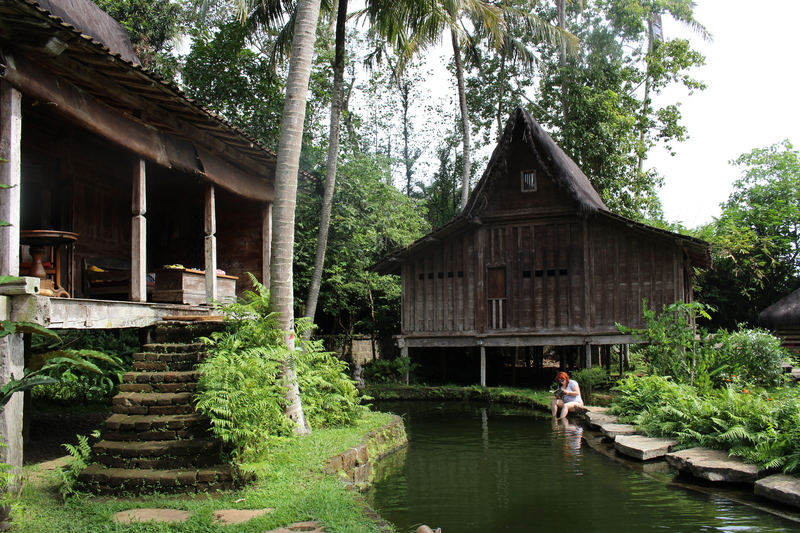 It’s nice that all their rooms are actually antique teak wood Javanese designed huts which have been crafted over 100 years ago by the Indonesian locals. 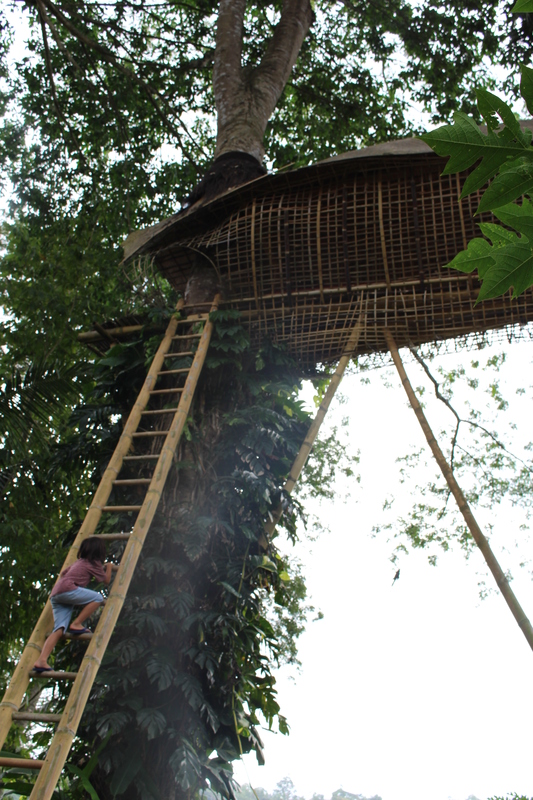 My friend’s son, Kai just had to climb their gigantic bamboo tree-house that resembled a mothership! Oh, how liberating it is for a child to climb and enjoy nature’s wonders! I told my son Santi that I wil ltake him here one day…. I booked this resort via Agoda for the FLOW Bali retreat mainly because of the pool which I know everyone would appreciate. Yes, that is really how it looks like up close and personal. Perfect, isn’t it? Upon checking in, we were pleasantly surprised to find out that we were upgraded to a Deluxe room (from our Superior room booking).Gee, thanks! 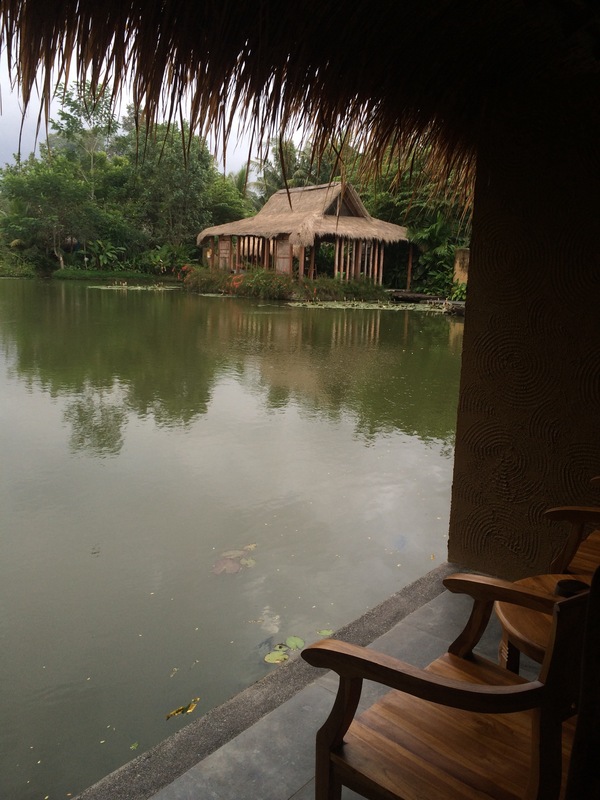 Our room was located on the 2nd floor which isn’t too child-friendly or baby-carrying-mommy-friendly but we had marvelous views of the pool and surrounding rice paddies. Usually, there is one king sized bed but I requested for triple shared beds since I roomed with two other adults. I was glad they complied. The bathroom had the least cookie points because it seemed real old and dark, without any natural light coming through (so important for me!). I didn’t even bother taking a photo. Breakfast wasn’t fancy either. Some days you choose from Continental, Indonesian or American fare. Other days, they laid out the buffet which didn’t have much options. They start serving at 8am, which I personally find late so if you’re an early riser, request for early breakfast. Again, they gave in to this request of mine. Pretty good service, I must say. This mother statue spoke to me and the other mothers in our group because she is breastfeeding and babywearing her children. Just like we do! Attachment parents unite! 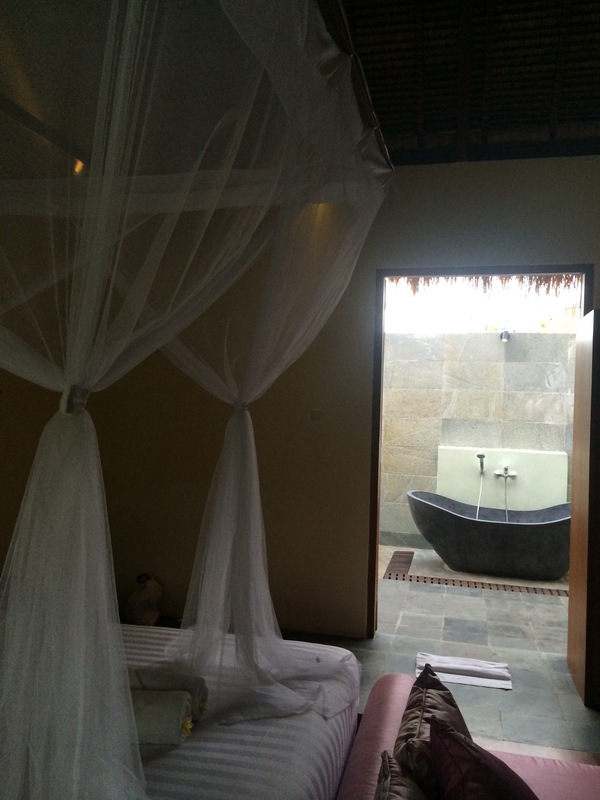 If you have the budget, book one of their villas for a more authentic experience and privacy. You will also be situated closer to the main entrance versus most rooms which takes about 5-10 min walk or a short golf cart ride to the reception. I chose to stay in this hotel purely because of its location. Right smack where the action is in busy Myeondgong where an abundance of food stalls and make up stores are located. 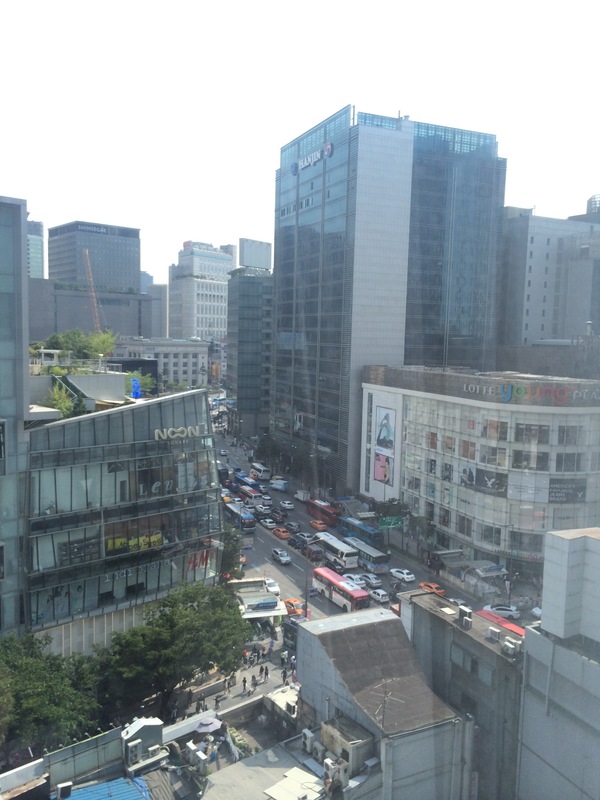 It is also infront of Lotte Young Plaza next to Lotte Hotel where many of my friends stayed. I booked 2 rooms months ahead via Agoda.com which was so very convenient. I chose the cheapest option which had no breakfast included but when my son found out we weren’t eating in the hotel, he and his grumbly tummy got very upset at me for 3 consecutive mornings hahahha. So if you’re traveling with children, make sure you wake up and feed them before hunger strikes! 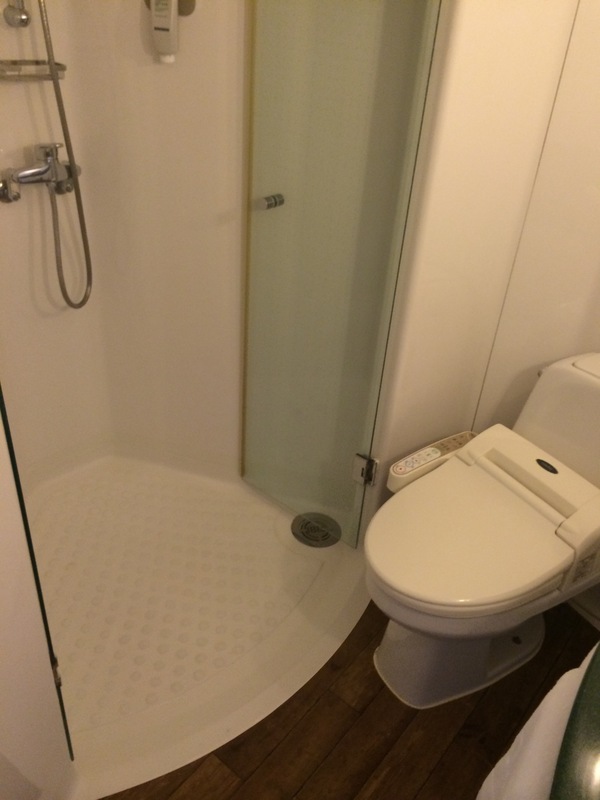 The standard rooms are 21 sq meters in size which had a small shower (that felt like you were in a space craft) and a high tech toilet just like the ones found in Japan. My son was amazed at this invention and wanted one for home! What we all loved was the comfortable bed, pillows and super soft sheets which was hard to peel away from in the mornings. 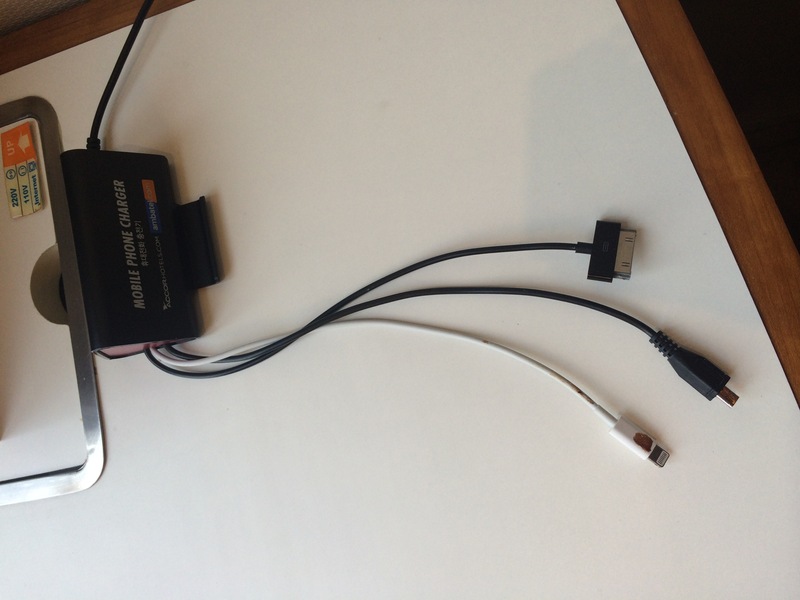 Plugs for charging and free wifi was available in the room, yay! Our room 1117 had a functioning AC while my parents room 1120 had a faulty one so they requested for a fan to be brought up. 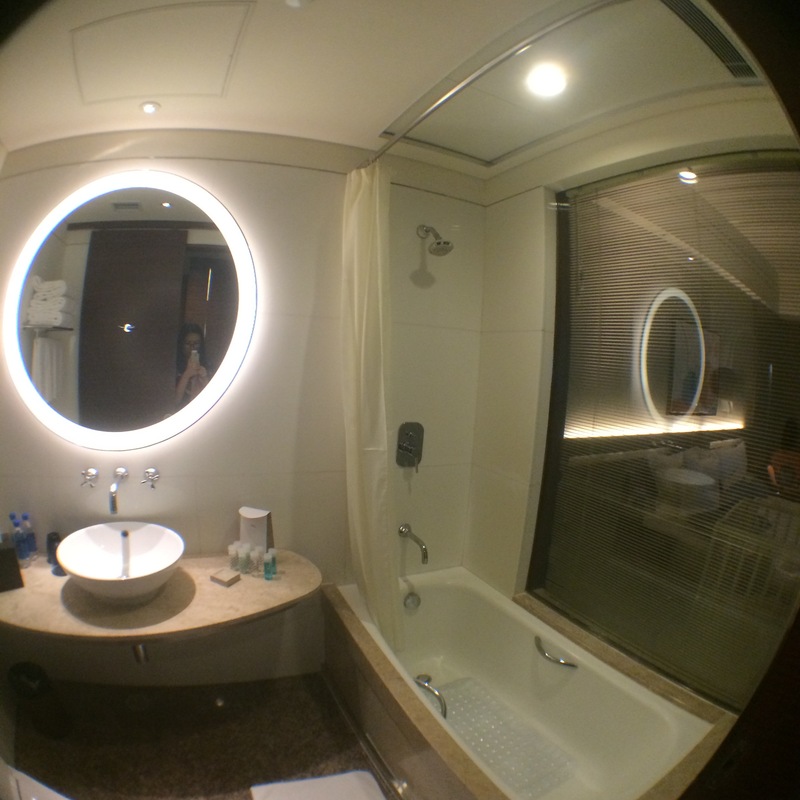 There was a 24-hour gym and a hot bath facility which I didn’t get to try. 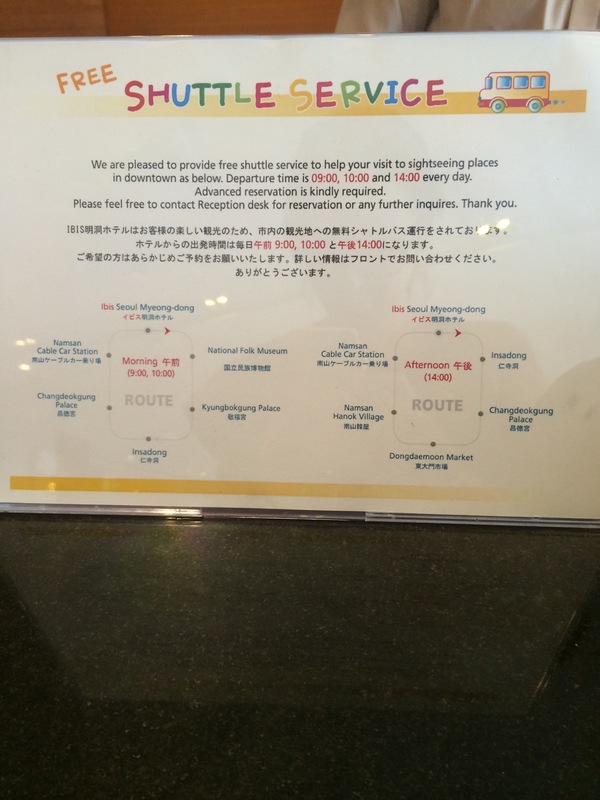 They also have a free shuttle to certain areas but we didn’t get to make reservations ahead so we didn’t have space anymore that day. If you’re staying in this hotel, make necessary shuttle arrangements for your sight seeing at least a day before. The only odd thing was that reception was on the 19th floor so it was out of the way. Can someone explain to me why do they do this??! 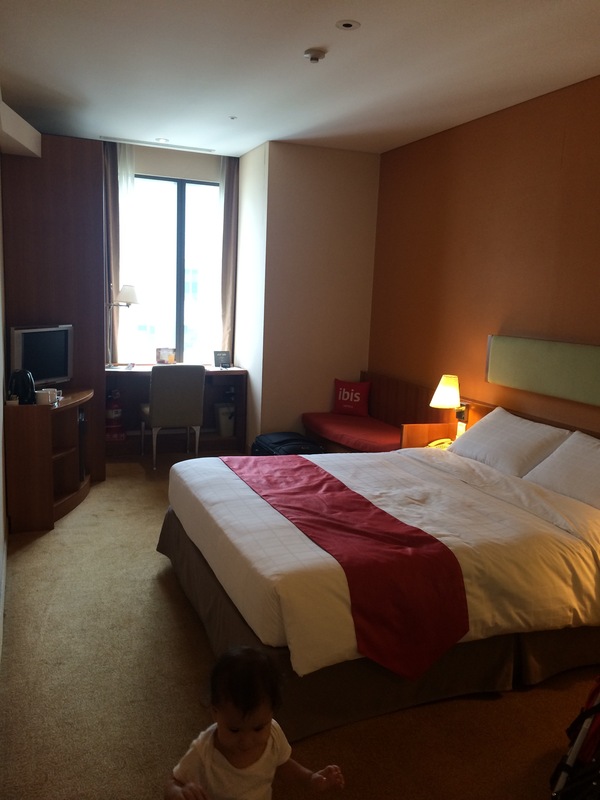 I would recommend this hotel for people who like shopping at fashion, make up and skin care outlets or trying out the endless food stalls found on the streets of Myeongdong. Next time we return to Korea, I wish to stay in a traditional style homestay close to nature to get a feel of the old Korea. To give you a little background of how this trip came to materialize, my high school friends and I have been planning a trip out of the country since last year. Initally, I was supposed to bring just one child, my 1 year old daughter Maya (because we are still breastfeeding). My cousin-in-law who is also part of my high school circle was supposed to be my roomie with her 1 year old son as well. When my parents found out about this trip, they felt sorry for my son because I wasn’t planning on bringing him. 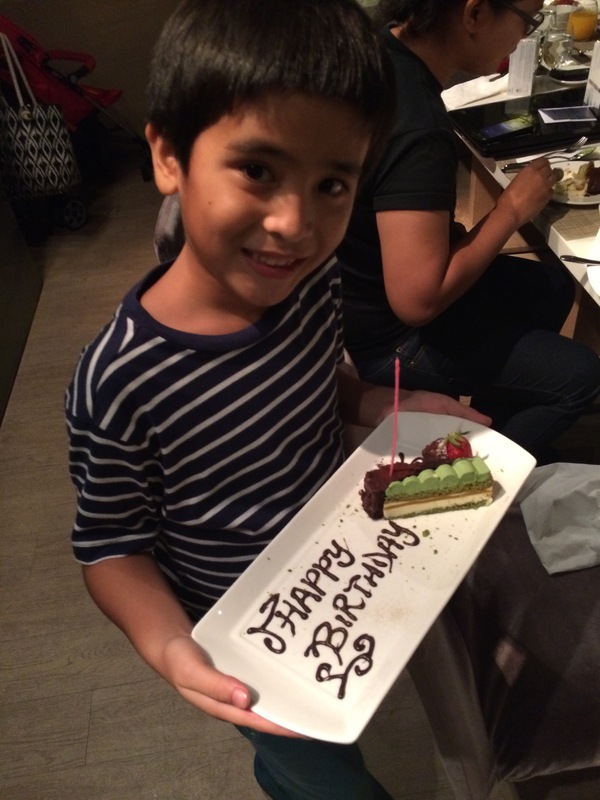 So they told me that they would bring him because it was his birthday month, lucky little boy! Families check into L’Hotel Island South for its location. 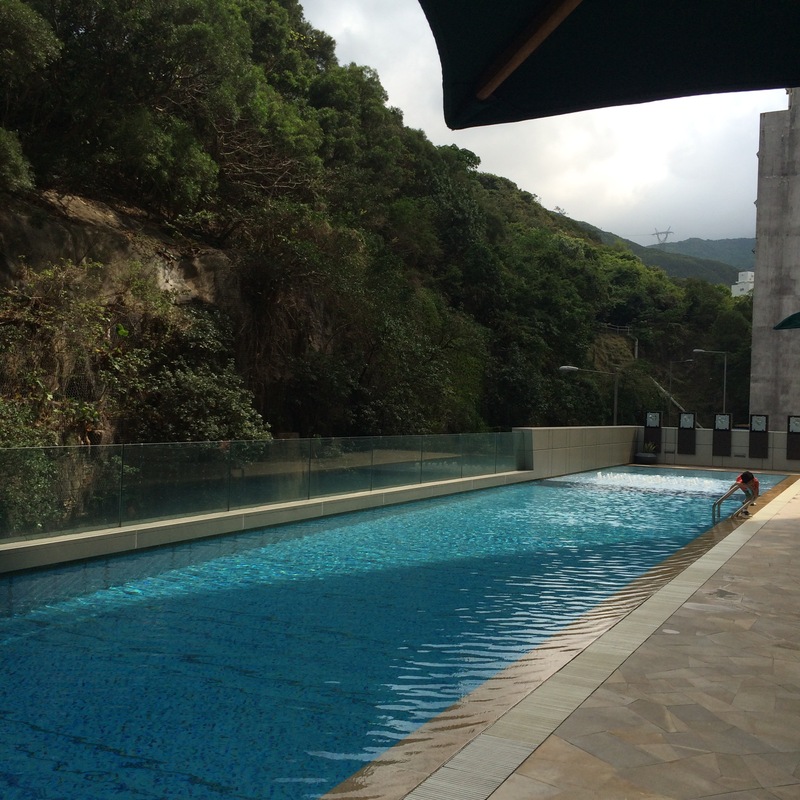 It is very close to Ocean Park, Hong Kong, only 5 minutes away with free shuttle. Some even say it is walking distance. So if you are planning to visit the theme park, consider this hotel property. The Manzanos were looking forward to staying at this hotel for our celebratory weekend in Hong Kong because we read very good reviews at the ever-so-reliable Trip Advisor. After our first meal at LIS Cafe, one staff presented my son with an impromptu surprise birthday cake when they found out it was his birthday the next day. The gesture was so very sweet! It’s these little things that truly make a world of a difference in customer service. 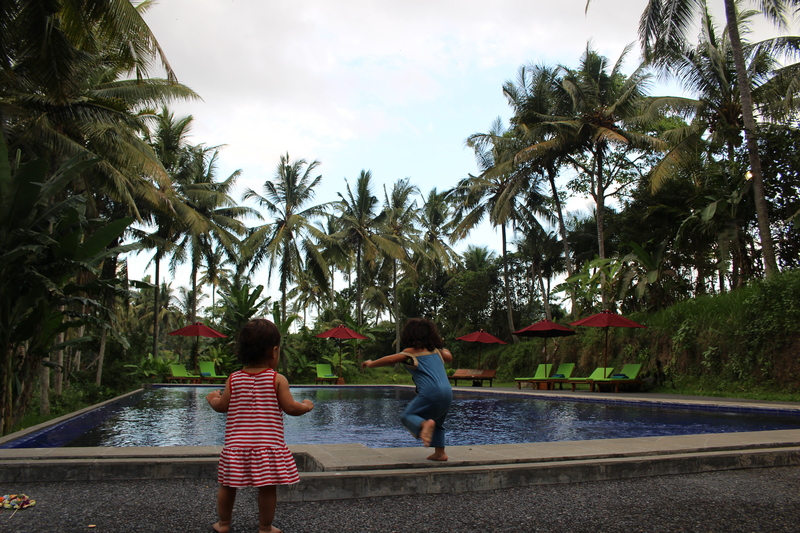 We loved the pool by the mountain which had a safe shallow area for little tots. Too bad we didn’t get to swim! I packed swimming attires for both kids but not for myself 😛 The gym also has spectacular mountain views but didn’t get to work out either because watching over the kids burns carlories just the same.